This morning, crowds gathered outside Parliament to commemorate the 8.8 million babies whose lives have been lost to abortion since the passing of the 1967 Abortion Act. Prolife organisations stood side by side to mark this sombre occasion, with a minute’s silence from 11:04am; the moment Royal Assent for the Bill was declared 50 years previously. 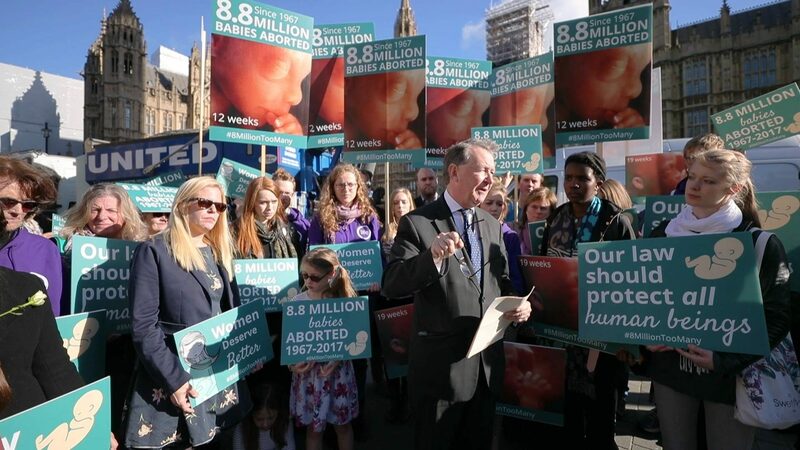 Prior to the silence, cross-bench peer, Lord Alton of Liverpool, gave a speech to those gathered, reflecting on the brutal legacy of the Abortion Act in the UK. It has been estimated that since the Abortion Act came into effect, 8,894,355 abortions have taken place in the UK. “We are heartened that so many prolife organisations have joined us today and so many loyal supporters from across the country have come to commemorate the 8.8 million lives lost through abortion and the generations of women who are mourning the loss of their children. After 50 years of ‘choice’, we do not see freedom, liberty and equality as promised. Instead, we see women face the same struggles but with little ‘choice’ on offer from society, other than abortion. A tragedy almost too enormous to take in. I marked the anniversary in a blog entry, with specific reference to the courageous Leo Abse, the great reforming Labour MP who did so much to oppose the slaughter.